The RSI Evaporative cooling system is specifically designed for all greenhouses and building where temperature control in warm climates is needed. The system is 100% portable, being able to be rolled or lifted from area to area easily. Our unit holds an impressive 4.5 gallons (576 ounces) which will last days pending the air temperature. 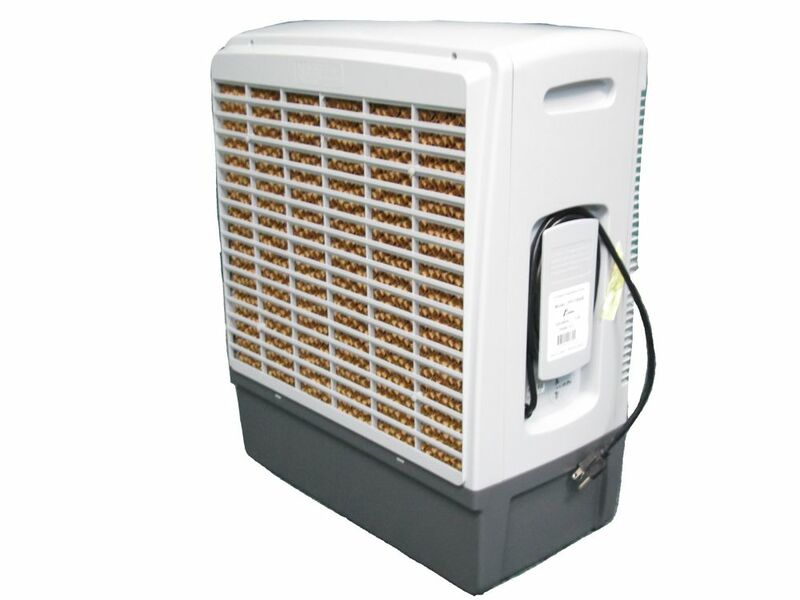 The RSI Evaporative cooler, also called a swamp cooler, features a 3 speed direct drive motor and is designed to cover 1060 CFM (Cubic ft/minute). This translates to 610 sq ft. or a standard 8ft x 10ft room, or an 8ft x 12ft greenhouse. Portable Design- Can be used with or without caster wheels (supplied). Side access for easy filling, with Water level indicator. Separate controls for pump and motor. 2 inch rigid media filters for maximum cooling performance - compressor system cools naturally, efficiently and inexpensively. 4.5 Gallon reservoir, Size: 20.5 inch Wide x 11.5 inch Deep x 25 inch Tall without casters, 27.5 inch Tall with casters. Make your shed stylish and functional with this operable aluminum window. Features tempered glass. Measures 16 In. wide x 24 In. high and includes pre-cut trim and screens. Cardboard template cut-out included. Not available in Quebec Market. Available in store by Special Order Only. See associate for details. The Palram greenhouse anchoring kit adds extra protection against strong and harmful winds (up to 90km/h). It cleverly fits to your existing Palram Greenhouse (Harmony, Nature, Mythos, Hybrid, Balance, Essence or Octave) and can be secured into concrete/pavers, directly onto grass/bare earth or even decking (all required fixings provided). 1060 CFM Evaporative Cooler The RSI Evaporative cooling system is specifically designed for all greenhouses and building where temperature control in warm climates is needed. The system is 100% portable, being able to be rolled or lifted from area to area easily. Our unit holds an impressive 4.5 gallons (576 ounces) which will last days pending the air temperature. The RSI Evaporative cooler, also called a swamp cooler, features a 3 speed direct drive motor and is designed to cover 1060 CFM (Cubic ft/minute). This translates to 610 sq ft. or a standard 8ft x 10ft room, or an 8ft x 12ft greenhouse.